Medellin’s biggest annual festival is just around the corner. The 2012 Feria de las Flores (Festival of Flowers) will run from August 2 – 12. 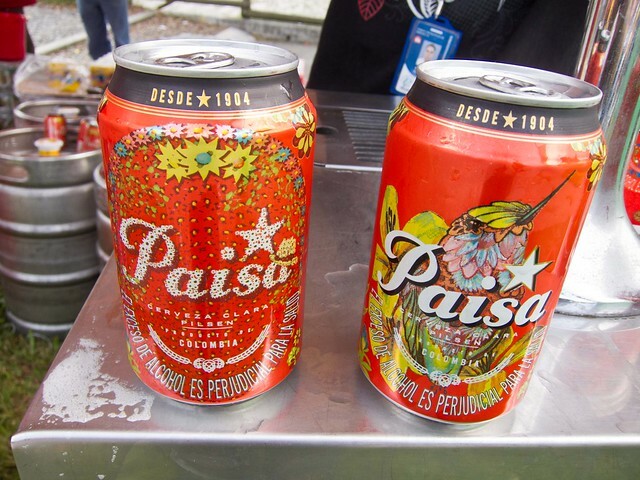 The 10-day festival is a celebration of paisa culture, and this year’s schedule is packed with tons of events, big and small. I’ve had the chance to attend the last two years, and the atmosphere is a lot of fun. Just writing about it today has me feeling sentimental, wishing I was going to be there this year too. If you’re planning to visit for the festival, I’ve used and can recommend Wimdu for help in finding apartment rentals. In 2010, during my first year attending the events, I made a few mistakes, mostly due to a lack of awareness and information. Below, I’m going to share highlights of this year’s festival, as well as some tips so you can relax and enjoy each event. J Balvin, a reggaeton singer from Medellin who has blown up in the last 12 months, is headlining this concert along with Zion y Lennox from Puerto Rico. The opening acts include a mix of artists, including Combo de las Estrellas which are responsible for “Me Voy Por Medellin,” the unofficial anthem of La Feria, and the resident DJ’s of Oz and Prizma discotecas. Tickets went on sale July 20th, and if I were in Medellin, I’d be going to this show. Expat Tip: Buy the more expensive “Platino” tickets, and arrive very earlier than normal. You’ll get in faster (possibly saving an hour or two of waiting in line), and you’ll have a better view of the stage. Big concerts in Colombia are not always well-organized, as I learned last year when I spent three hours waiting in line for a Wisin & Yandel show. Paisas have some very old cars that are in excellent condition. 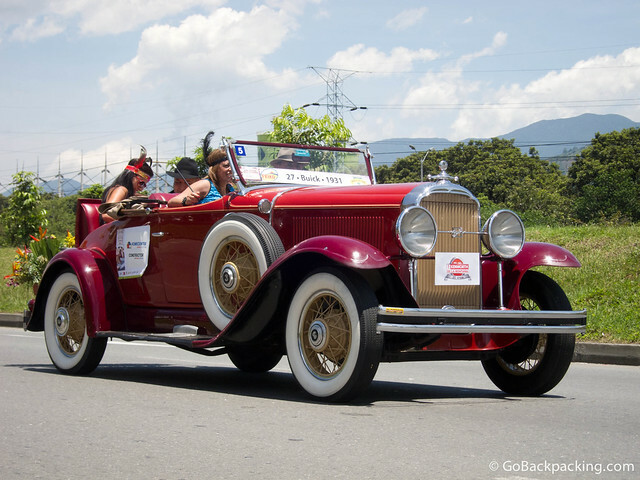 Every year, they dust the off, and dress up in period costumes to go for a drive in the antique car parade. In addition to the classics, you’ll find everything from decorated dump trucks to fire engines in this parade. 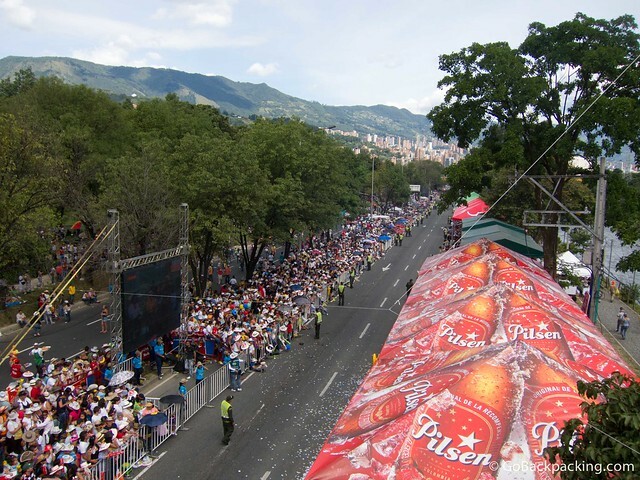 Expat Tip: The largest gatherings of people along the parade route occur near the metro stops, such as Poblado station where Avenida Las Vegas and Calle 10 intersect. The further away you walk from the metro station, the fewer the people, and the better your view. In the last two years, the parade route has run from south to north along Avenida Las Vegas. In 2011, I had a terrific view from the area around Ciudad del Rio, at the midpoint between the Poblado and Industriales metro stations. Hours: 8 a.m. a 6 p.m. Cost: 50.000 pesos ($28, the same as last year). Maximum 3 tickets per person. If you attend no other event during La Feria de las Flores, attend the Flower Parade. It’s a one of a kind parade where paisas of all ages carry flower displays on their backs, for hours. Everyone from little kids to women and men in their 50’s and 60’s can be seen carrying the flowers. The flower arrangements are made in the nearby pueblo of Santa Elena, and entered in a competition in various categories. There are a plenty of commercial displays too — advertisements made of flowers! Expat Tip: More than any other parade, the crowds gather in mass for the Flower Parade. Either arrive to your spot along the route hours in advance, or buy a ticket to enter the side of the street with bleachers. Even with a ticket, you’ll need to arrive early if you want to get a good seat in the bleachers. In 2010, without a ticket, it was hopeless to get a good, comfortable view of the parade route. In 2011, I with with a paisa friend, Alexandra, and my friend Troy. We were able to hit the parade route, and walk around until we found a guy selling tickets. We didn’t pay more than a few dollars over face value. Once inside, the bleachers were too full, so we stood between two of them, where we had an excellent view of the parade, and easy access to beer! Parade Route: I don’t know, exactly, but it’ll run near at least one or two metro stations. 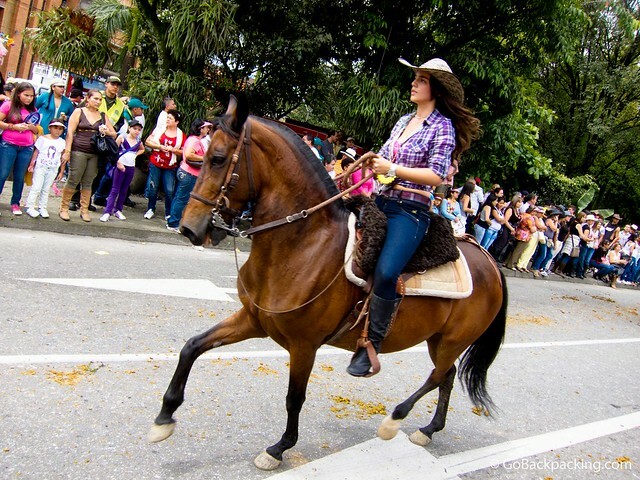 Paisas LOVE horses, therefore La Cabalgata is a huge event every year. About 6,000 horses are trotted through the city, their riders swigging rum and guaro straight from the bottle as they go. Technically, it’s against the rules to drink on the horses (for both their safety, and that of the riders), but it’s a tradition that continues all the same. La Cabalgata is my favorite event of La Feria de las Flores. It’s a huge party atmosphere, with people setting up tents, and selling all sorts of food and drink along the parade route. It’s similar to the scene in Barranquilla for Carnaval. Expat Tip: Get an early start so you can watch the parade without having to endure the smell of horse crap. Leave your valuables at home, it was at this parade in 2010 that a pickpocket stole my Blackberry within minutes of me taking it out to text a friend. If you’re comfortable on a horse, you can look into renting one so you too can ride in the parade. Do you have a useful tip for attending La Feria de las Flores? Leave it below in the comments. This post was written by Dave, and brought to you by Wimdu.